Mmmmmm……are you thirsty yet? My favorite alcohol is definitely tequila. I love it in any form, whether straight up or mixed with something. But my weakness is margaritas. I’ll drink them on the rocks or blended…but definitely with salt! This recipe is perfect for summer – so refreshing and sweet. You can easily adjust it to your personal tastes, as there are lots of different opinions on how to make the perfect margarita. 1. Clean strawberries and remove stems. Reserve two for garnish. 2. 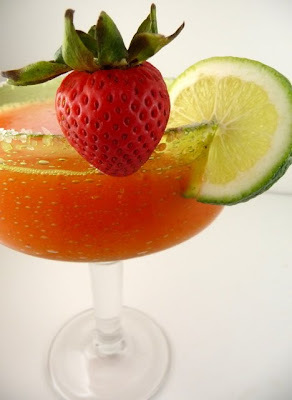 In a blender combine the strawberries, lime juice, sugar, orange juice, ice, tequila and triple sec. 3. Blend until smooth, adding more ice if needed. 4. Rub the rim of the glass with lime juice and dip in salt. 5. 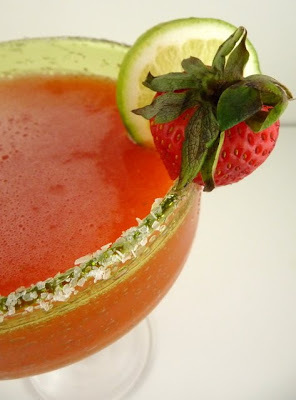 Pour in strawberry margarita and garnish with lime wedge and strawberry. Mmm....looks very refreshing and delicious. Very summery. Can't wait for the hot weather to be here.